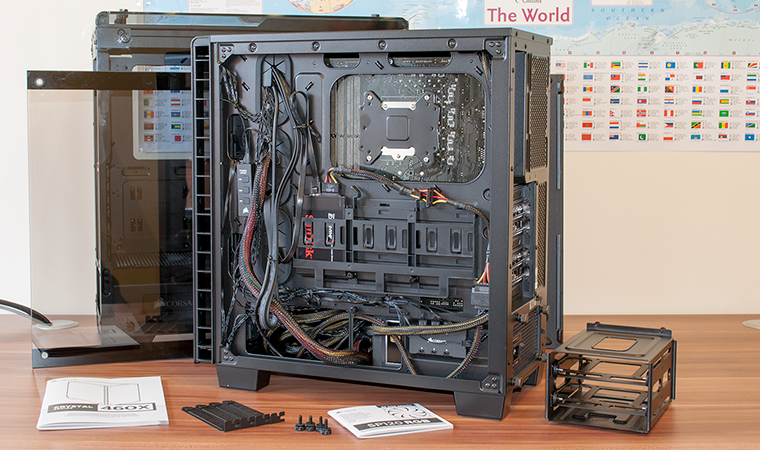 Enjoy a chassis that flaunts large swathes of tempered glass? 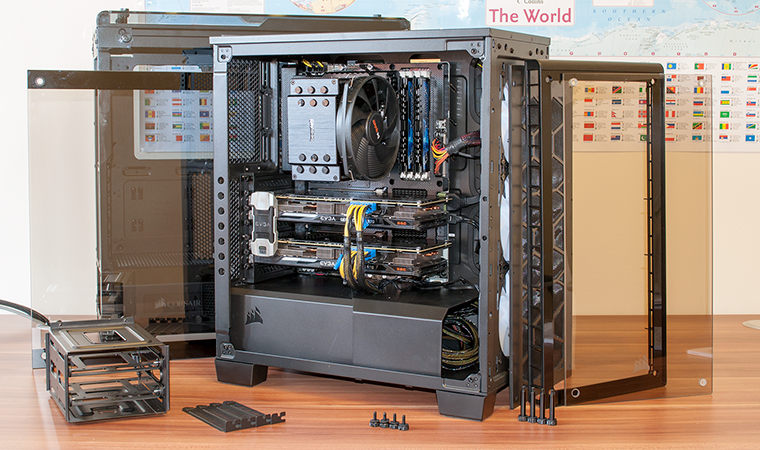 Then you should definitely have Corsair's new Crystal Series on your radar. Launching today in the form of the 570X and 460X, the new range promises beautiful and modern case design, and having examined the range-topping model, we're now turning our attention to the smaller, more affordable 460X. 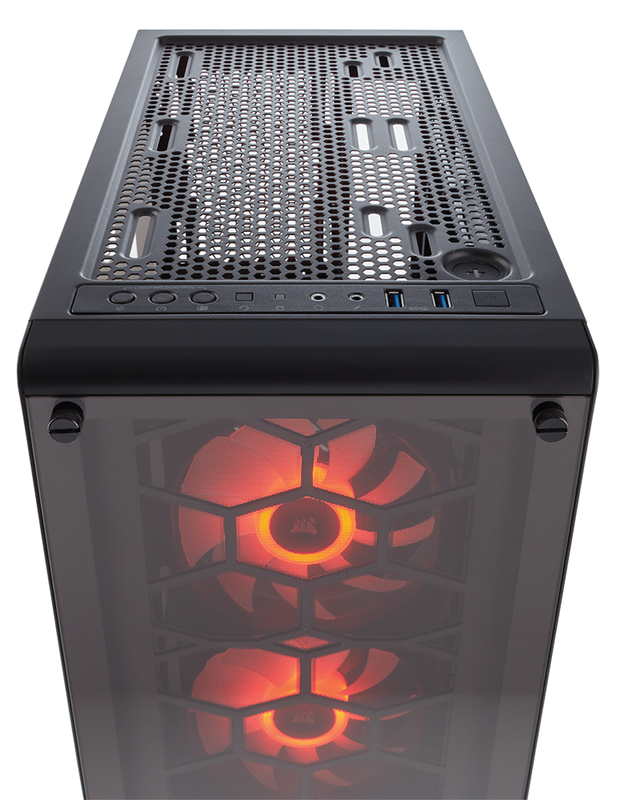 Prices start from £120 and what makes the 460X interesting is that it arrives in stores in a choice of two flavours. The base model includes one 140mm red LED fan and a 120mm exhaust, while the 460X RGB that's on the test bench today includes the same trio of 120mm SP120 RGB fans found in the 570X at an increased cost of £150. Getting a sense of deja vu? There are two reasons for that. Firstly, the tempered glass panels on the front and side look very similar to those on the 570X. There's no glass on the top or rear side, so the effect isn't quite as impressive, yet the glass still looks and feels like a high-quality addition, giving the case a pleasing overall appearance. The other reason why the 460X may look familiar is that it is, for all intents and purposes, a modified version of the existing Carbide Series 400C. 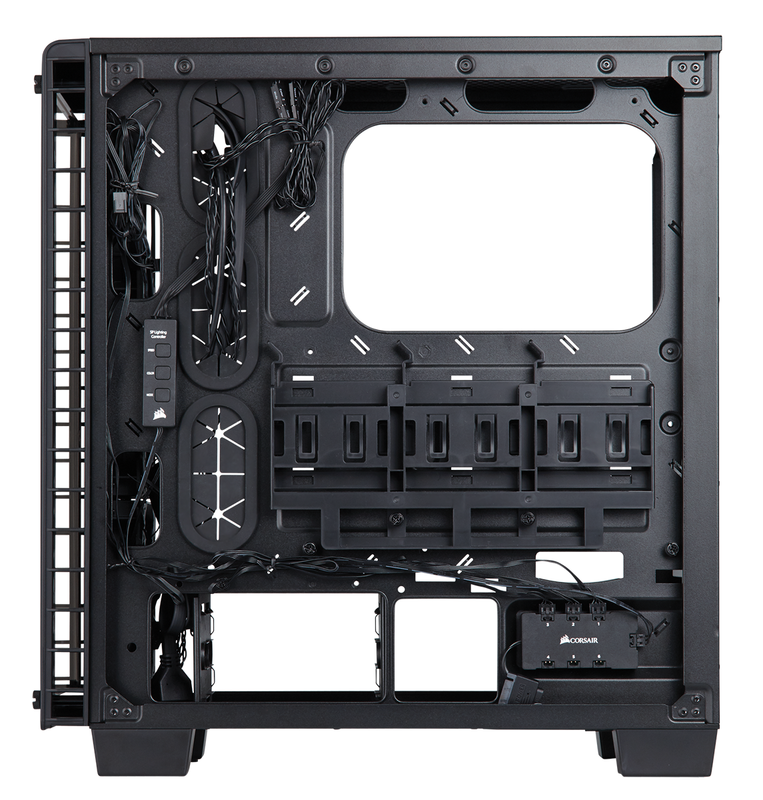 Gone is the solid front panel, the quick-release side window has been swapped for a tempered glass panel held in place by four rubber-tipped thumbscrews, and the top I/O panel has been updated. Lining the top-front edge, it now includes mode, transition speed and colour toggles for the RGB fans, alongside the standard selection of reset, audio jacks, dual USB 3.0 and a power button. All the essentials, though there's still no love for forward-looking USB Type-C. 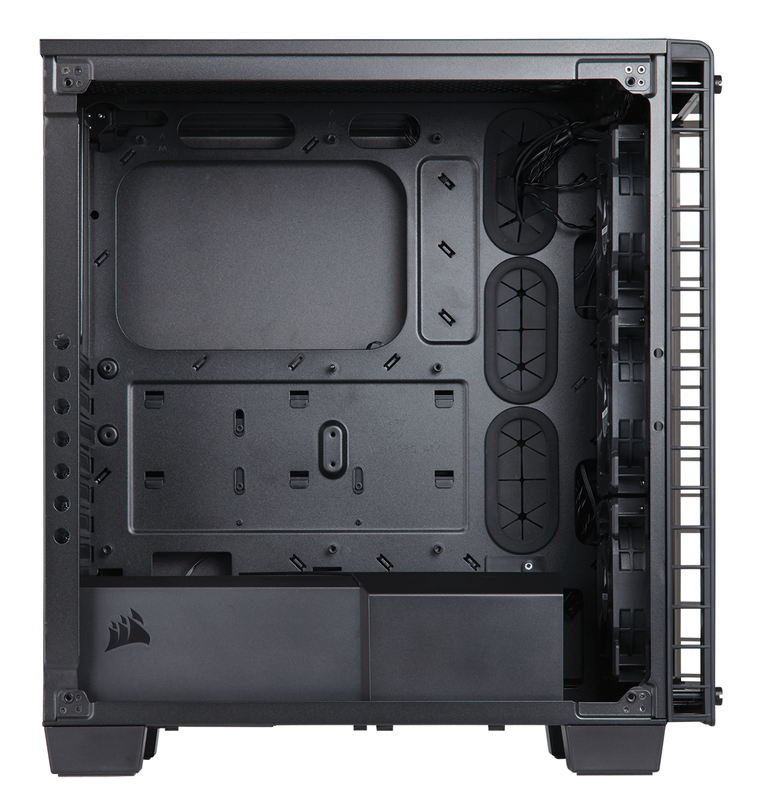 Considering the similarities that exist between multiple Corsair models, it's only natural to give consideration to the various price gaps. 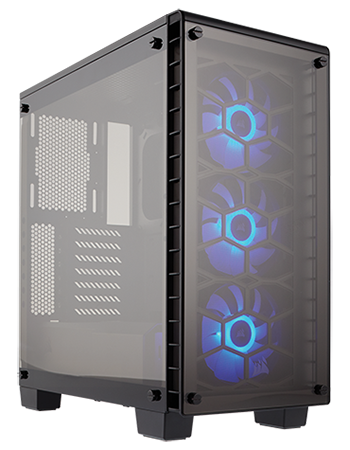 The Carbide Series 400C is available for £100, the Crystal Series 460X adds tempered glass for £120, while the 460X RGB includes a trio of multi-colour fans for £150. No shortage of choice nor options, though it goes without saying, you have to be passionate about tempered glass and RGB illumination to consider spending 50 per cent more for what's essentially the same underlying chassis. Corsair has made only minor changes to the interior, and that's a good thing as the 400C layout is a tried and trusted quantity. Dimensions of 464mm (H) x 220mm (W) x 440mm (D) make it reasonably compact for a mid-tower frame, yet on the inside there's room for a couple of graphics cards measuring up to 370mm in length and a CPU heatsink standing up to 165mm tall. There are also half-a-dozen fan mounts in total - including two 120/140s up top, three 120s or two 140s up front, and a 120 at the rear. 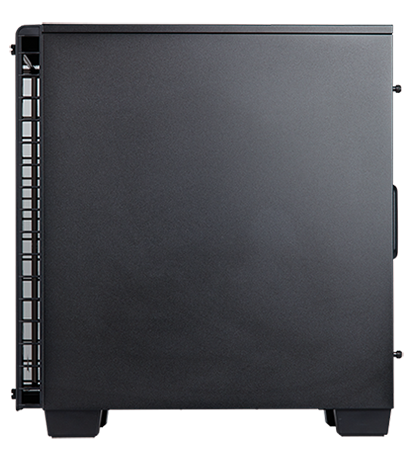 The front can easily support a 240, 280 or 360 radiator, while the top could possibly squeeze-in a 280 radiator depending on motherboard, or a 240 is space is tight. Unlike the pricier Crystal Series 570X, there's no dedicated area for a reservoir or pump, yet if your plan is to stick to air cooling or an all-in-one liquid cooler, space is ample for a high-end build and the end result looks nice and neat. 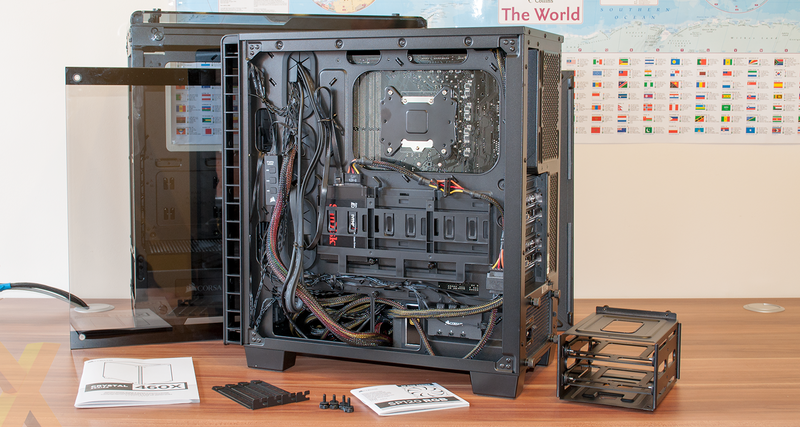 Corsair keeps things tidy by a two-piece plastic shroud that attaches to encompass the PSU and hard-disk cage. Part or all of the shroud can be removed during installation by undoing a pair of thumb screws, and due to the size of our power supply, we also opted to remove the drive cage in order to give ourselves more space for cabling. A trio of rubber-grommeted routing holes help keep everything tidy, as do mesh filters on the top, front and bottom. The top filter is a mesh lining held in place by magnets, the front filter is removed along with the glass and front panel by undoing four long thumb screws, and the bottom filter pulls out from the back of the case. The quality of the glass feels as good as the 570X, and while the panels don't appear to float in the same way, some might prefer the fully-enclosed approach, and the 460X should be quieter as a result. 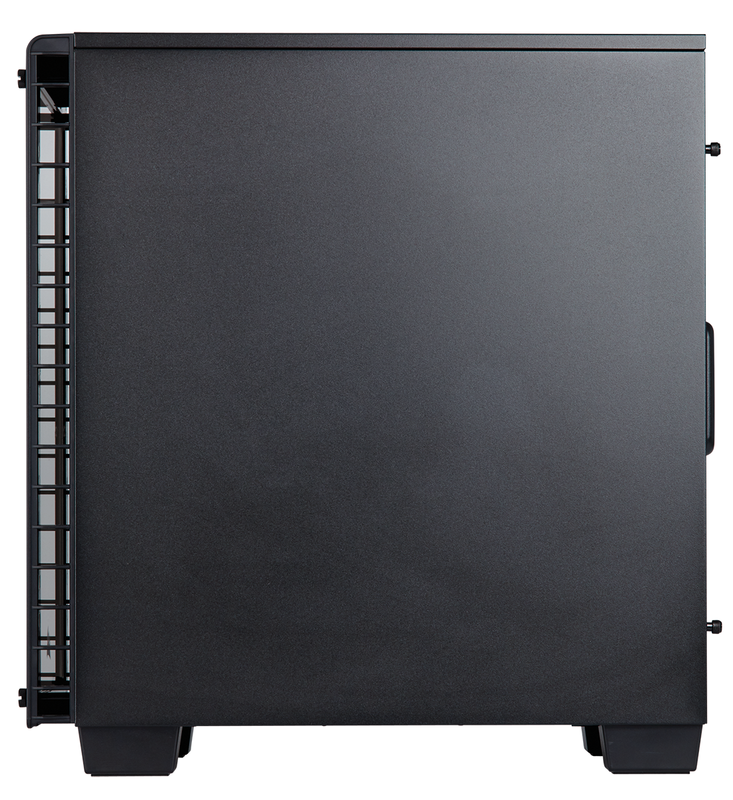 In keeping with the Carbide Series 400C, a trio of 2.5in drive trays are mounted to the rear of the motherboard tray. There isn't a huge amount of room back here, however the solid side panel is hinged, making it easier to attach. The same hardware installed in the 400C looked very tidy, yet we struggled to achieve the same level of finesse on the 460X. This can be attributed to all the extra cables belonging to the fans - each 120mm unit has two cables (a three-pin connector for the motherboard, another connector for the hub), and the hub is wired to a controller that then feeds the I/O panel. It isn't the neatest arrangement, and if you've become accustomed to controlling RGB lighting via an app, the button sequences on top of the case feel cumbersome. The RGB fans, and their associated price premium, will inevitably elicit a mixed response. Those who can't get enough of flashy LEDs will immediately be drawn to Corsair's RGB solutions, yet if bright lights aren't necessarily your thing, the standard 460X faces stiff competition from other mid-tower alternatives touting tempered glass. 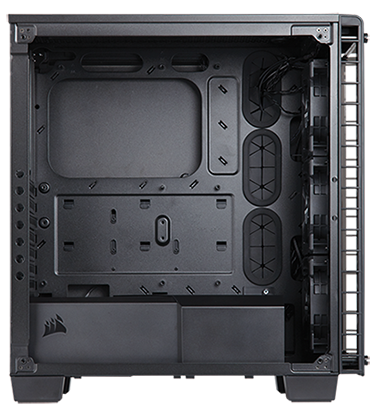 NZXT's S340 Elite, for example, offers a similar design and is readily available for under £90. Let's see how the 400C, 460X, 570X, S340 Elite, and others, compare with regards to performance.